Use this Activity Book alongside the The Story of the World Vol. 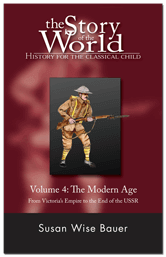 4: The Modern Age, Text for a full one-year history, geography, and literature program. Reading lists, activities, timelines, and map exercises, give a more complete picture of life and events in the modern times. Don’t just read about history — experience it! This comprehensive activity book and curriculum guide contains all you need to make history come alive for your child. Along with the accompanying book The Story of the World Vol. 4: The Modern Age, Text, this Activity Book provides a complete history, geography, and literature program for one year. Build a model of the Crystal Palace, make Ned Kelly’s armor, construct a timeline of the Modern Age, and more. Due to the intended age level and the subject matter contained in the book, the Activity Book for Volume 4 does not contain coloring pages; they were replaced with additional projects and activities intended for slightly older students. But if you think your student might want to finish their collection of coloring pages that span history, you can buy our supplemental pack of Coloring Pages and color on! Each chapter includes Review Questions of the text to be discussed with your student orally. The answers are listed underneath each question. Some parents prefer to use these questions to assess their student’s comprehension as well as review. So you can type these up, OR you can purchase our Written Comprehension Responses where these Review Questions are already typed for you with plenty of space provided for your student’s answer! If you purchase this Activity Book, you have permission to make as many copies as you need for use within your own immediate family. Or if you want to save yourself the trouble of lugging it to Kinko’s, you can purchase extra Student Pages for Volume 4. This Activity Book is available as either a bound Paperback or a downloadable PDF. Disappointed to see that we have to pay extra for the coloring pages due to the intended age group. My kids are in the intended age group and we have always used the pics for coloring and as they got older for projects other than coloring. I am very disappointed in a change that only serves a small portion and to keep using the books as they were is now more expensive. Maybe it’s only $5 more, but I feel like it’s the principle. That’s my 2¢.